“How sad it is! I shall grow old, and horrid, and dreadful. But this picture will remain always young.” | Awesomeness For Awesome's Sake. Why it’s, Mr. Ozzy Osbourne Canacorn! The number one cat of the house and The Wife‘s best friend ’till the end! As y’all may or may not know, we actually have four cats that live with us…I know, crazy…but Ozzy (or Ozymandias, as I sometimes call him…which will become important to today’s post in a minute or two) is definitely the King of the house. And every King deserves to be immortalized right? Well, I think so…and since I don’t know any sculptors that could whip up a mighty statue of our favorite feline, I decided to do the next best thing. Commission a portrait! But who could do justice to this proud and arrogant beast? What mere mortal hand could possibly capture the Greatness that Ozzy inspires? As fate would have it, I found such an artist…on MySpace!? You see, I was on the page of one of comic book’s greatest artists and writers, Rick Veitch, when a young lady’s name in his top friends caught my eye. Through Leah’s MySpace page I found her Etsy store…success! Not only were there examples of her work…but they were quite good. None of the animals featured were as regal and stately as Ozzy, but I could tell that Leah was definitely the artist for this particular undertaking. I quickly contacted the lovely lady to see if she was up to the task of capturing the timeless beauty of The Oz-man. Now hop on over to The Wife’s blog if you want to see some more pics of Leah working on the portrait! Well done Mr. Canacorn. Well done. I know right? Score one for the husband. Myrtle, wasn’t he immortalized? But I agree… well done! I bet she’d totally do The Goo for you, Myrt! Just click the link to her Etsy shop and shoot her a convo! Leah’s prices are listed there as well. Oh, and when WAS the last time someone did the goo for you anyway…not counting Steve. Leah Moore… isn’t that Alan Moore’s kid? Or niece? I have a man crush on Alan Moore. 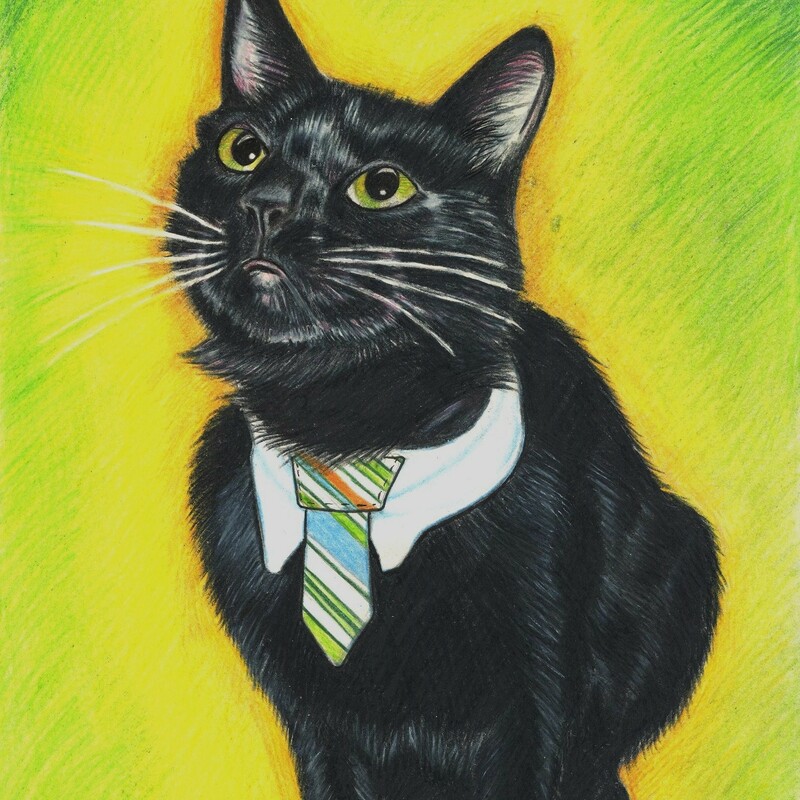 If I dressed my cat in a necktie he’d scratch my eyes out. As it is he lies on the steps like Tina the Twilight Zone doll waiting for me to trip and die. Anyway, nice cat. Does it bother you that he dresses better than you do? I doubt he’d waste his piss on Corn’s records. Who needs all those Jane Oliver records? @ Pom, Correct on the first guess. Hail, indeed. 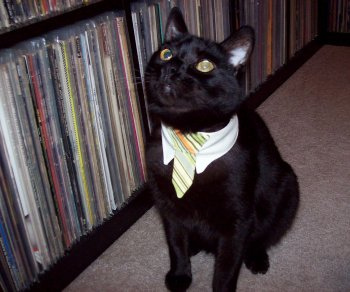 @ Steve, Oz is NOT a fan of the homemade collar and tie, but every once in a while he indulges The Wife and gets all Handsome Boy Modeling School. @ Myrt and Steve, I know, I’m a bit obsessive…. Can you believe I don’t own any Del records? But I do have some of his cousin’s, the one and only Ice Cube! As for Jane Oliver, blah! I’m a Streisand-Man all the way! Except no imitations! So adorable, I think I just grew ovaries.